Have you seen “the restoration project” at the pier in Princeton? 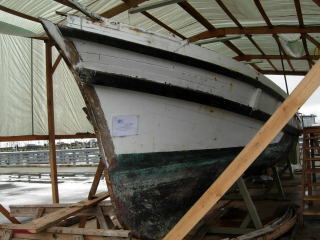 The old fishing boat, the “Irene” is being restored. When I was a boy, this was the “Emerald of the bay.” In those days there was no “Johnson Pier”. The breakwater jetty had not even been constructed. The “Irene”–a double-ender–wasn’t the largest boat in the harbor but it was the most envied. In recent years the “Irene” had fallen into almost total disrepair. A gent named Leland, who was sailing around the world on his 60-foot sloop (poor devil,) took pity on the old “Emerald of the bay” and decided to restore the “Irene”. He’s formed a non- profit that accepts donations and is vigorously trying to restore this classic fishing vessel. I was never a commercial fisherman but as a long time local, I did spend some time on the “Irene” with its owner George Bettencourt, now deceased. Some of my most treasured memories were spent with George on board the fishing boat named after his beloved wife. My mom went to school with George and his brother Henry, who was best known as “Uncle Henry”. They were both such nice people; everybody loved George and Henry. Their sons, George, Jr. and Dave, still live on the Coastside. On most days you can find Leland and his wife Cecily working on the “Irene” (in the parking lot near the sea wall in the harbor). I made a small donation and they told me that next time I visited I should wear my “grubbies” and have fun working on the project. This entry was posted in Princeton-by-the-Sea, The Irene. Bookmark the permalink.